How Do You Picture Stow? Home/Uncategorized/How Do You Picture Stow? PHOTO CONTEST FOR STOW RESIDENTS! 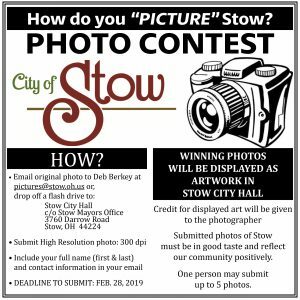 The City of Stow is holding a contest to solicit photos from residents, photos that reflect our community. Winning photos will be displayed as artwork in Stow City Hall! Submitted photos must be of Stow, be in good taste, and reflect our community positively. Deadline to submit your photos is February 28, 2019.